We hear much of the Christian woman having a meek and quiet spirit. Many loudly object. Others rigidly attempt to conform. But what is a meek and quiet spirit? Do we really understand the meaning of that phrase? Or – have we taken someone else’s meaning, or – have we even invented a meaning of our own? Let’s look at those words in the Scripture to understand, first of all, what a meek and quiet spirit is, and then, how that kind of a heart will affect the whole of our lives. Meekness is not a word that just describes what a woman is to be. The word, in actuality, describes what every Christian should be. Moses was described as a very meek man, above all the men which were upon the face of the earth (Numbers 12:3). Jesus said of Himself: I am meek and lowly in heart (Matthew 11:29). In His teachings, Jesus Himself declared: Blessed are the meek: for they shall inherit the earth (Matthew 5:5). The wise man who is endued with knowledge is described as a man whose behavior demonstrates the meekness of wisdom (James 3:13). We can readily see, then, that meekness is a quality that should be possessed by all Christians. What, then, does this word meekness include? Meekness is referred to in 1 Peter 3:4 as being in the hidden man of the heart. It is an inward quality – something hidden – hidden deep within the Christian heart. The heart of meekness knows of a certainty that God’s dealings with us are good. The Scripture declares: If God be for us, who can be against us (Romans 8:31)? Therefore, meekness does not resist, meekness does not fret, meekness does not worry, and meekness does not dispute. It is a heart that is settled upon both the goodness and the power of God, upon both the love and the might of God. It simply trusts God to do as He wills, according to His good pleasure. This quality of meekness should be evident in all of God’s people. Quietness will, of a necessity, accompany meekness. Because meekness dwells in the hidden man of the heart, quietness will result in that life. We are instructed to pray for leaders and those in authority so that we may lead a quiet and peaceable life in all godliness and honesty (1 Timothy 2:2). We are commanded and exhorted by our Lord Jesus Christ, that with quietness they work and eat their own bread (2 Thessalonians 3:12). Again, we are exhorted to study to be quiet (1 Thessalonians 4:11). This verse has the meaning of: Make it your aim to exhibit this calm, undisturbed demeanor. Listen to the same word used in Acts 21:14: And when he would not be persuaded, we ceased, saying, “The will of the Lord be done.” One can hear the heart resting in God’s will. Again, listen to this same word used, though translated in a different way: And they returned, and prepared spices and ointments; and rested the sabbath day according to the commandment (Luke 23:56). The word quietness seems to carry with it a meaning of: undisturbed, peaceful, calm rest. Think back to the word meekness. Can you see how easily these two words go together? As we join the meaning of these two words, we find a meek and quiet spirit to be that inward heart attitude that is assured of God’s love and control and rests peacefully in Him, no matter the circumstances. As we look back to 1 Peter 3:1-6, we find the context of this passage to be for the woman who has a husband that does not obey the Word. What is to be her heart attitude? Should we see a fretting heart, a resisting heart, or a complaining spirit? According to the truth of the Word of God, no. On the contrary, we should see a woman who, by her pure and chaste behavior, adorns the doctrine of Christ so that her Lord may be seen in her life. From that meekness and quietness that is within, comes a calm outward demeanor, fully trusting in her God. Did you notice that 1 Peter 3 began with the word likewise? That word is saying that just like what has been previously described, she should exhibit the same attitude. Look back into 1 Peter 2:18-20. Wouldn’t a servant with a harsh master also have to possess a meek and quiet spirit to respond in a godly manner? Then read on – in verses 21-24, we see the wonderful example of that meek and quiet spirit demonstrated by Christ Himself as He entrusted Himself to Him who judges righteously. And for our final thought – Do not think that meekness and quietness will only be exhibited in the husband and wife relationship. In all circumstances of life, and in every situation that arises, the Christian woman should find her heart resting in the goodness and the power of God. From this meek heart will flow an undisturbed peace and calm that will be exhibited in her life. 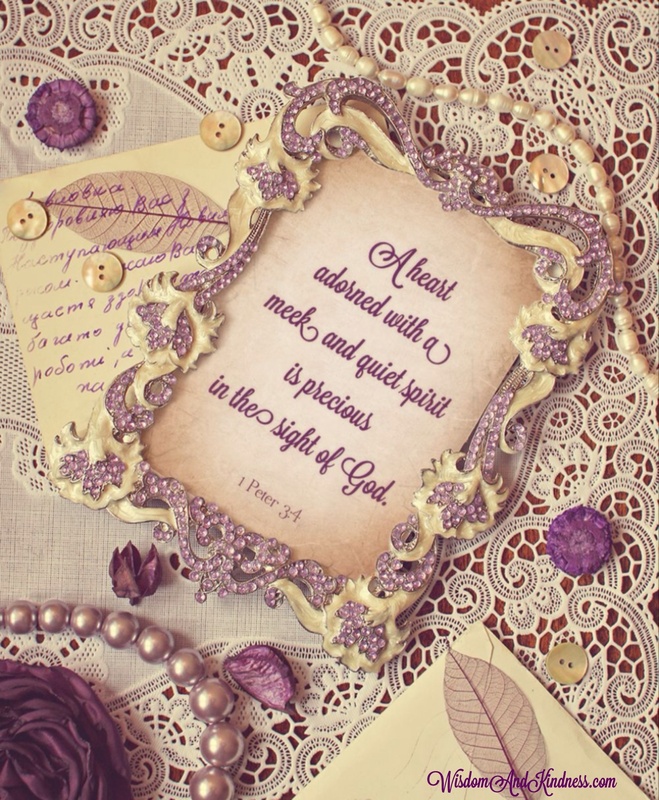 Truly a meek and quiet spirit is an adornment that is precious in the sight of God! It is evidence of simple faith, trusting in the Faithful One. The above post was first printed in Dawning Light © 2002.